Suspected gunmen believed to the herdsmen during the weekend resumed attack on Agatu Local Government Area of Benue, killing two persons. A source said the incident occurred on Sunday afternoon when seven boys went to take their bath at the stream in the community. “Unfortunately, they were ambushed at the stream by herdsmen who waylaid and opened fire on the unsuspecting victims, which led to the death of two of the boys. “Others managed to escape. The matter was also reported at the Agatu Police Police state,” the source said. Benue State Commissioner of Police, Fatai Owoseni, who confirmed the killing, described it as saddening and unacceptable given the efforts the command had made to ensure peace in the state. “It is saddening but we will attain peaceful coexistence among farmers and herders and with that in place we will soon have the people displaced by the crisis return to their ancestral homes,” he said. 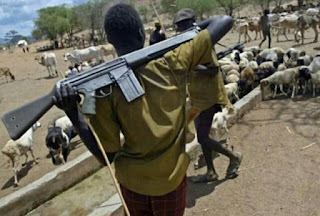 The attack came same day suspected herdsmen attacked a community in Guma, killing several persons and injuring others.